This post was last updated on June 24, 2014 to include a video. Being able to perfectly fry an egg is an invaluable skill in the kitchen. Whether you like it sunny side up, over-medium or cooked all the way through — you can add that special touch to a simple salad or have the perfect eggs and toast for breakfast. I like my fried eggs over-medium — when the yolk is still mostly runny. Dustin likes his eggs exactly over easy. If his yolk isn’t completely runny, he gets grumpy. To make perfectly fried eggs, all you need is: a skillet (non-stick, preferably), oil (butter or olive oil, for example) and a spatula. I also provide my preferred seasonings with this how-to. 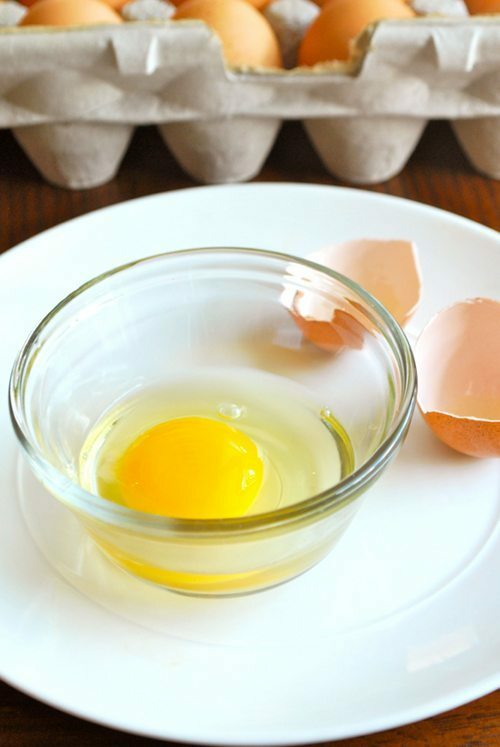 Follow these super easy steps for how to fry an egg to perfection. Choose a skillet that will easily fit how many eggs you’re making without crowding the eggs. I recommend using a non-stick skillet. 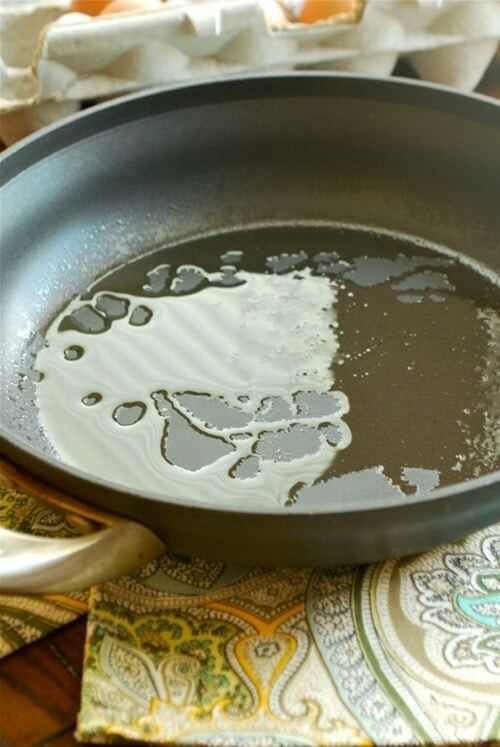 If you’re using a stainless steel or cast iron skillet, just be sure to use enough oil. Heat skillet over medium-high heat until hot. Once the skillet is hot, add the oil of your choice. I use either unsalted butter or olive oil. I have been using olive oil recently merely because I’m trying to avoid dairy products with my current diet, but I’d have to say butter is my preferred oil when frying an egg. 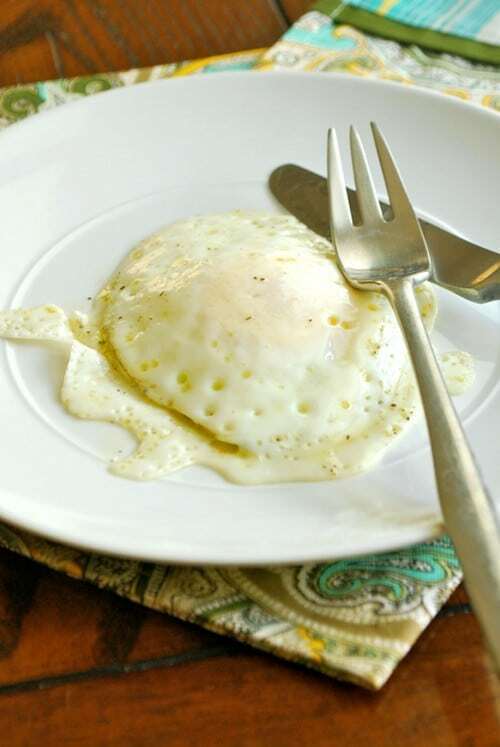 Butter adds a richness to the eggs, while olive oil adds a cleaner flavor. Other oil options include bacon fat, vegetable oil, margarine or even duck fat. Add about 1-2 tsp.oil per each egg you will be frying. 3. Allow the oil to get hot in the skillet. Wait for the oil to reach a hot enough temperature that it coats the skillet when swirled around. The goal is to entirely coat the skillet with a thin layer of oil. It’s usually recommended that you crack each egg into a separate bowl prior to putting it into the skillet. 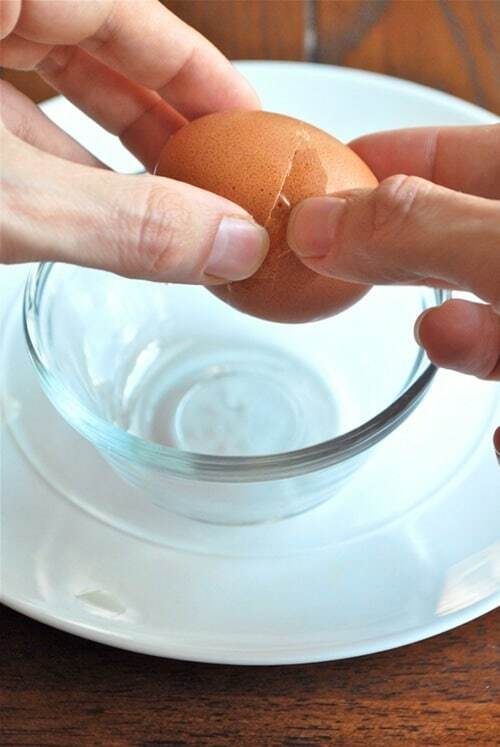 The reasoning is that, should the egg have something wrong with it or a piece of shell sneak through, it is easier to fix. Either way you choose, first (and slowly) drop the egg into the skillet, whites first, followed by the yolk. The skillet should be hot enough that the whites turn from translucent to white almost immediately and keep the yolk centered. After dropping the eggs into the skillet, just let them sit. Fried eggs don’t require very much fussing. They are ready to be flipped when the whites are set (no longer giggly) and the outer edges are just starting to curl up. I use a very light sprinkling of kosher salt, ground black pepper and Herbes De Provence over the egg while it’s cooking on the first side. It’s not necessary to season both sides. If you don’t have Herbes De Provence, a simple combination of dried basil, rosemary, thyme and oregano will suffice. Be careful not to over-season the egg, as a little spice will go a long way with eggs. 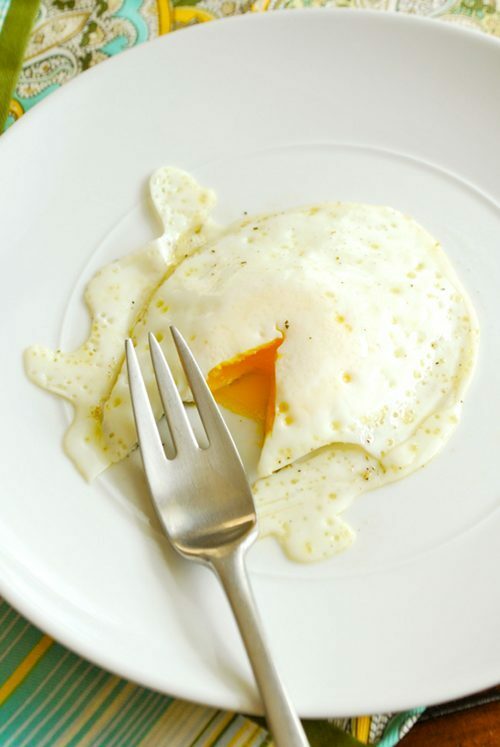 Sunny Side Up: when the egg is cooked only on one side, the yolk is liquid and the egg white is a bit runny. To do this, follow steps 1-6 above. If the edges start to curl before the whites in the center are fully cooked, cover the pan with a lid for a minute or two, like I do with this recipe. Don’t flip the egg. Once egg whites are cooked, remove from pan and serve. Over Easy: when the egg is cooked on both sides, the yolk is runny and the egg white is fully cooked. To do this, follow steps 1-6 above. Once egg whites are set, flip the egg over using a smooth spatula. Try to be as delicate — yet swift — as possible so as not to damage the egg yolk. Once egg is flipped, immediately turn off heat to the pan and allow egg to cook for 45-60 more seconds before removing from the pan. Over Medium: when the egg is cooked on both sides, the yolk is of medium consistency and the egg white is thoroughly cooked. To do this, follow steps 1-6 above. Once egg whites are set, flip the egg over using a smooth spatula. Once egg is flipped, leave over heat for 1 minute before removing from the pan. Over Well: when the egg is cooked on both sides until the yolk has solidified. To do this, follow steps 1-6 above. Once egg whites are set, flip the egg over using a smooth spatula. 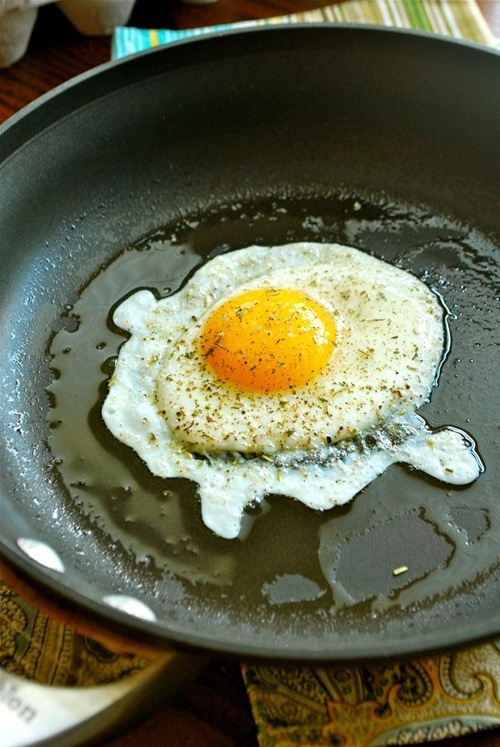 Once egg is flipped, leave over heat for 2 minutes before removing from the pan. Over Hard: cooked well on both sides with a broken yolk. To do this, follow steps 1-6 above. Once egg whites are set, break yolk and then flip the egg over using a smooth spatula. Once egg is flipped, leave over heat for 2 minutes before removing from the pan. Well, there you have it! Follow these easy steps for how to fry an egg to perfection every time. CLICK HERE FOR LACEY’S 7 MUST HAVE KITCHEN TOOLS! I love my eggs over medium, but don’t need to flip them when cooking them this way. Someone years ago just told me to cover them up with a lid big enough to cover edges..and leave on but check them until they’ve developed a cover over them. Works like a charm, no broken yolks, and also I cook mine in butter. They’re delicious. Yay! I’m so happy I could help, Jos. Now, hopefully your waiter will know what the terms mean too! do you leave your heat on medium-high while cooking the egg? mine always seem to get to brown. Hi Toni, yes I keep mine on medium-high throughout the cooking process. Hmm…does it turn brown before the whites are all cooked in the center? I went through a few years where I absolutely hated eggs but during my last pregnancy, I craved them. Now I eat at least 3 a day. Have you ever tried frying them in coconut oil? It gives them a hint of sweetness…nom nom. Hi Tara! No, I’ve never tried using coconut oil, but will have to try. For no particular reason, I don’t tend to use coconut oil when cooking, but I definitely need to pick some up to try it out. Thanks for the tip! I like mine over medium, too. In fact, that last photo looks perfect to me. Add a piece of whole wheat toast or an English muffin, and I’m there. Hi Jeanne! Couldn’t agree with you more. Thanks for stopping by! Thank you for these wonderful egg tutorials! Eggs are an important part of my family’s diet. Now I can finally make over-medium fried eggs perfectly. I finally invested in a non-stick skillet, but for the past few years have been cooking solely with cast iron. 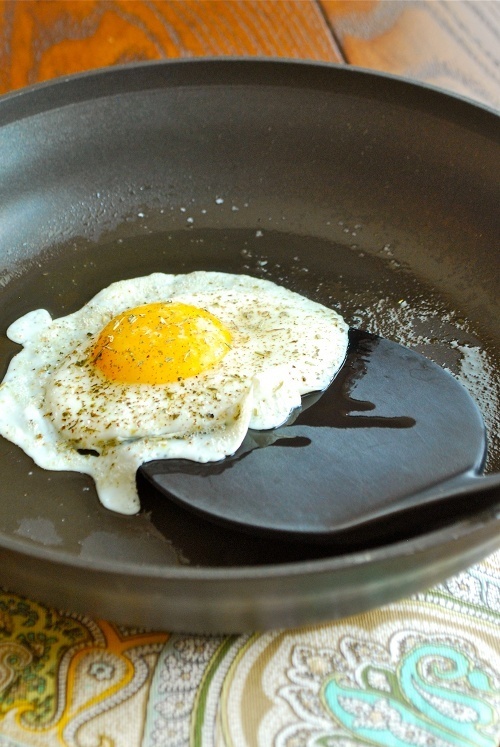 A tip if you’re making eggs in a cast iron skillet – use enough oil/fat to keep it from sticking! For those of you who are meat lovers, you really can’t go wrong cooking your fried eggs in about a 1/4 inch of bacon grease.